It’s official… my month-long East Coast and European adventure is just over a week away and I can’t wait. With the joyful knowledge that I’ll be indulging my taste buds with all-things-delicious-and-naughty, I’ve been making an effort to modify what I’m eating both in terms of quality and quantity. I haven’t been ruthless and have definitely succumbed to moments of weakness, such as my untimely arrival to my sister’s right as her famous chocolate cherry chunk cookies were coming out of the oven. For the most part however, I’ve successfully reduced my consumption of the usual suspects of carbs and saturated fats. Dieting isn’t easy for anyone, and I’m certainly not an exception to the norm. In focusing primarily on protein, vegetables and low-fat dairy, I’ve had to get a bit creative in order to find dishes that… well… don’t taste like I’m on a diet. Finding dishes that aligned with my dietary modifications requited a bit more creativity and consideration than simply succumbing to my usual cravings. Throughout my menu planning and recipe experimentation, I’m pleased to have discovered a handful of seriously healthy recipes that are both flavorful and satisfying. 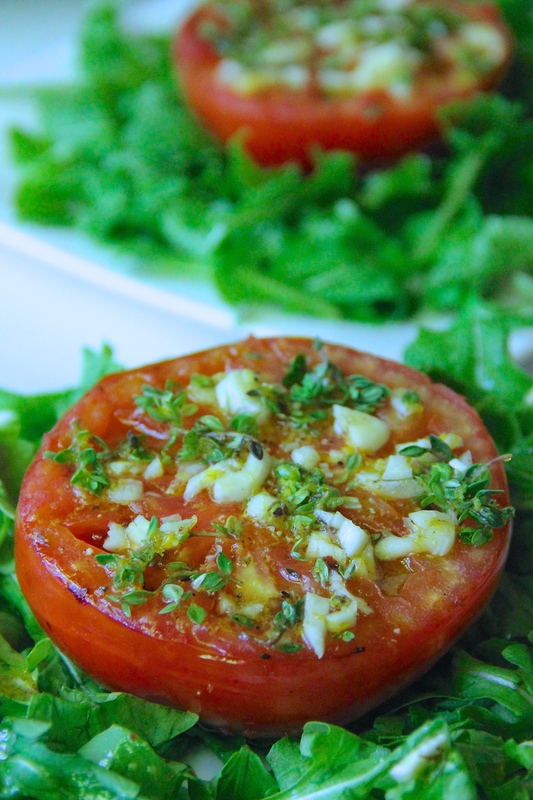 This week I’m sharing my recipe for grilled tomatoes with garlic and lemon thyme. Two halves make for a perfect meal when served over a bed of leafy greens, or one half works perfectly as a side for just about any main dish. Enjoy, and happy thankful Thursday! Heat your outdoor grill, cast iron grill pan or George Foreman grill. 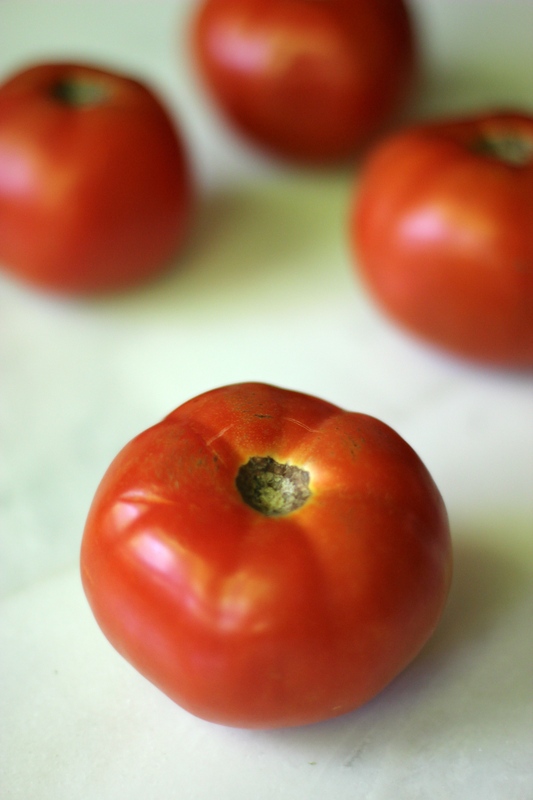 While the grill is heating, rinse the tomatoes and cut in half lengthwise. 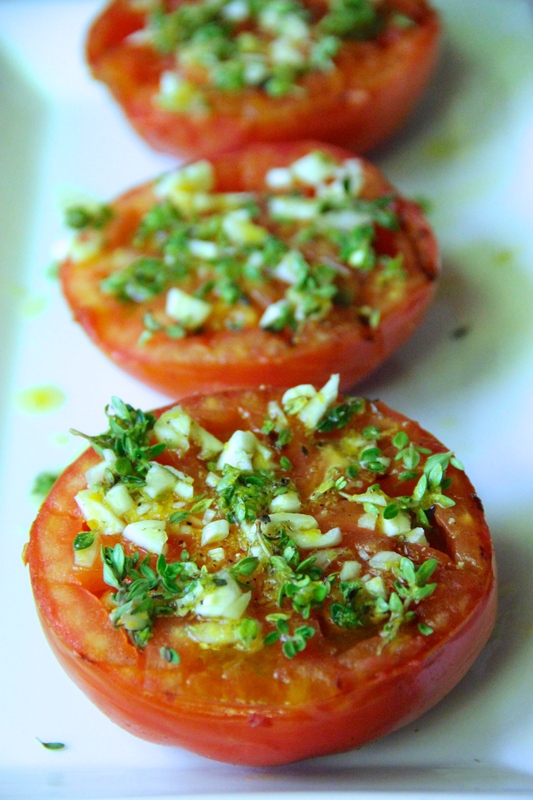 Brush the “tops” of the tomato halves with olive oil, and set aside. 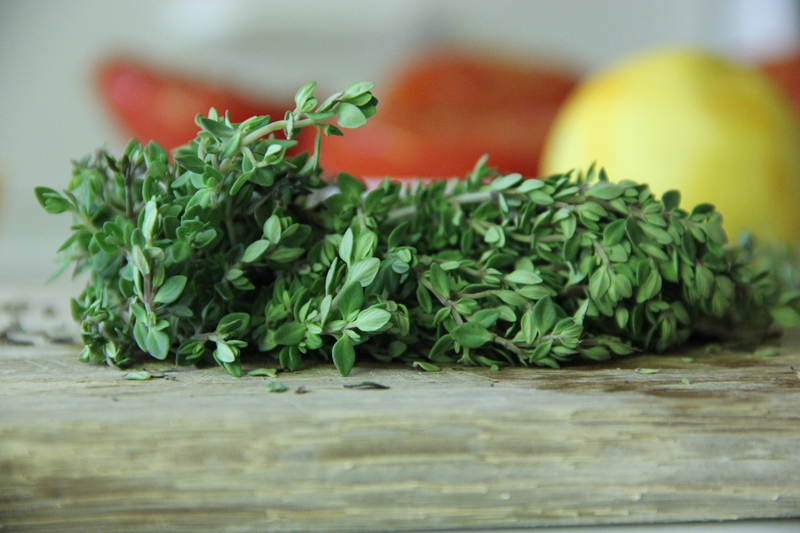 Rinse the lemon thyme and using your fingers, remove the leaves from the stems to the best of your availability. coarsely chop if desired. Using a grater, shave the peels of 2 lemons into a small bowl. Add the juice of 3 lemons, olive oil, garlic and lemon thyme and mix thoroughly with a small whisk or a fork. Add salt and pepper to taste. 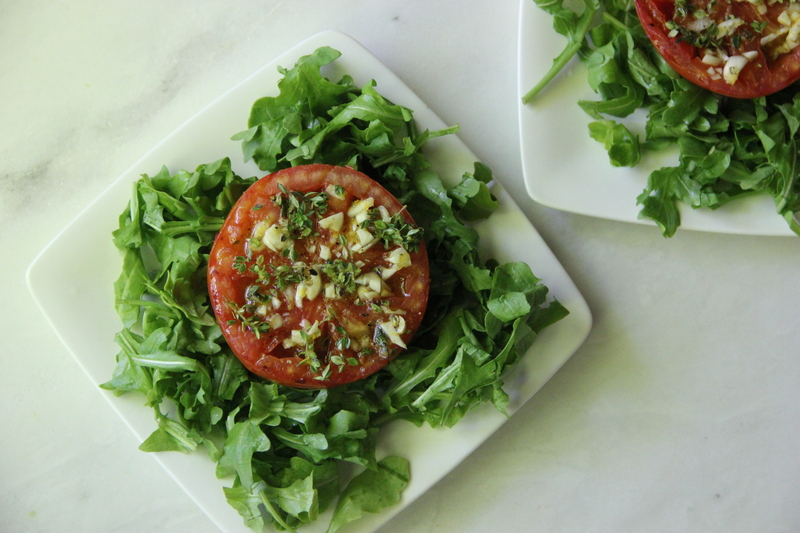 Take the tomato halves and place facing down on the grill for approximately 3-4 minutes, or until just beginning to show the char marks. Using tongs or a spatula if needed, turn the tomatoes over and cook on the other side until the skin just begins to blister (approximately 1 minute). Remove from grill, drizzle with the garlic and lemon thyme mixture. 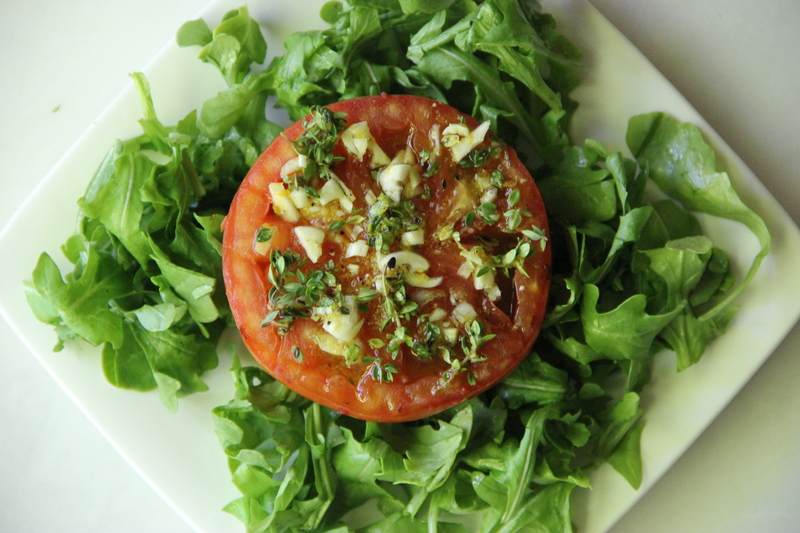 Serve individually or over a bed of leafy greens (the garlic and lemon thyme mixture doubles as a great dressing).